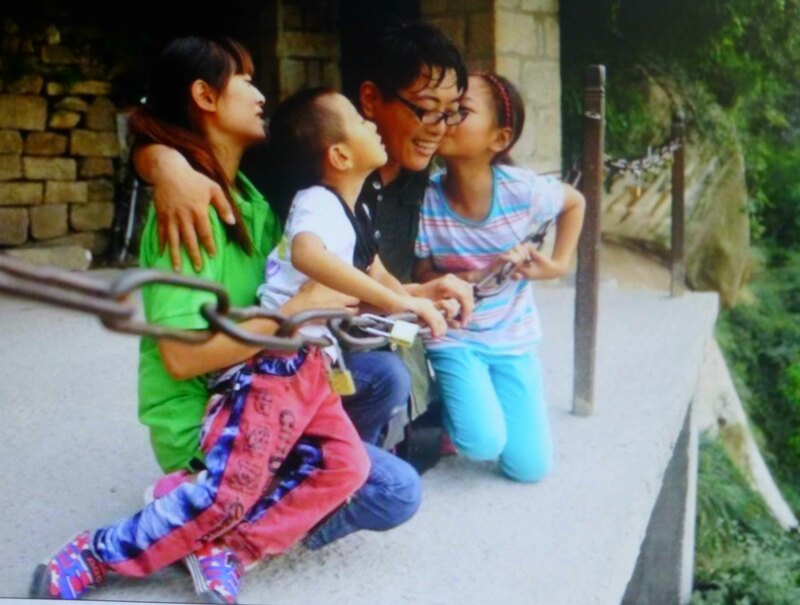 Chen Zhou’s says, God of Heaven took my legs, but he gave me a beautiful wife and a pair of healthy children granting me a platform where I can make my life meaningful. Everyone gets knocked down in life. The winners get up no matter how many times they get knocked down. I’ll keep fighting as long as I breathe. Born in 1983, Chen Zhou, age 30, lost his legs in a train accident when he was age 13. He then started singing for money on the streets. To survive, he also shined shoes, sold newspapers and repaired electronic appliances. Today, Chen Zhou is more than a traveling musician. He is a mountain climber, an inspirational speaker and an advocate for the handicapped. In fact, he has climbed China’s Five Great Mountains including Mount Tai eleven times (more than 5,000 feet above sea level—the base starts at 490 feet—an elevation gain of more than 4,500 feet). Mount Tai has been a place of worship for at least 3,000 years and has served as one of China’s most important ceremonial centers—emperors often traveled to the summit of Mount Tai to pay homage to heaven. The stone stairway to the summit has 7,200 steps. To give you an idea of how high that is, the stairway in a two story house usually has 14 steps. If Mount Tai were a house, it would be about 514 stories high. For a comparison, the tallest building in the world, the Burj Khalifa in the United Arab Emirates, only has 163 floors. To walk up those steps with his arms, Chen Zhou uses a pair of home-made wooden boxes that each weighs seven pounds (watch videos to see how he does it). Yu Lei is Chen Zhou’s wife, originally from Henan Province. They first met when she heard him singing in the streets for donations in the town of Jiu-jiang in Jiangxi Province. She was deeply touched by his story, introduced herself and they became friends. Chen’s positive attitude toward life and powerful will impressed Yu so much that she fell in love with him, and they married. She felt that she had found her hero. 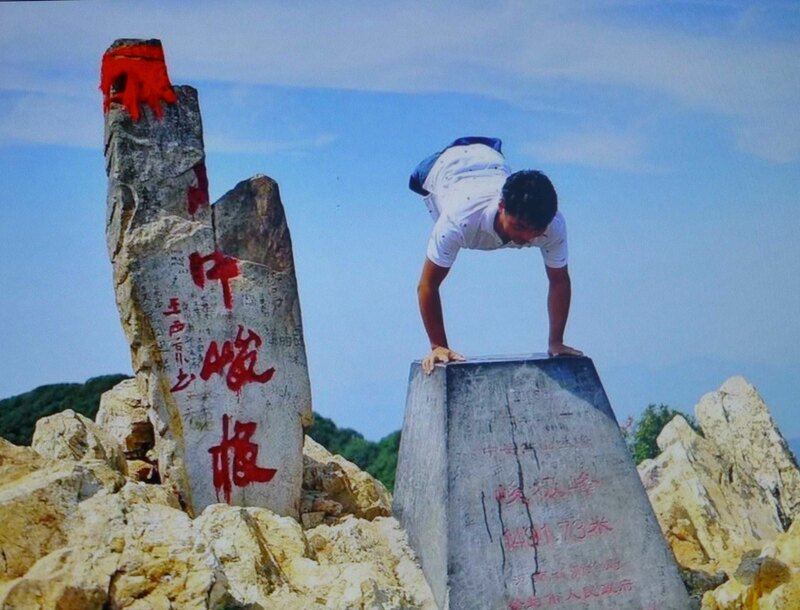 Chen Zhou promised to have a traditional wedding ceremony on the top of Mount Tai. It took him 19 hours to complete the hike to the summit. 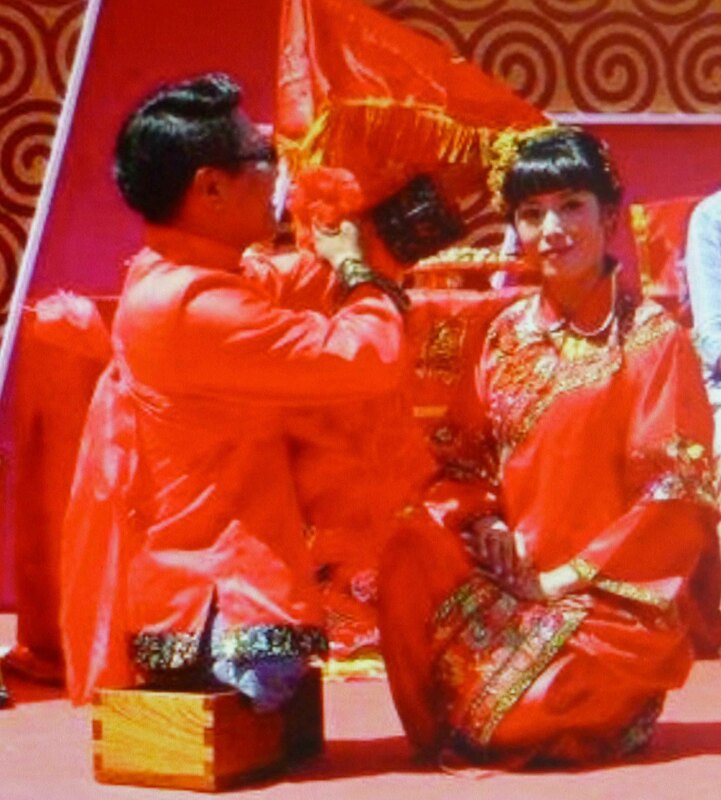 In the ceremony both Chen Zhou and Yu Lei wore bright red Chinese traditional costumes to celebrate their marriage and happiness. The couple has a daughter and a son. Chen Zhou’s future goals are to climb mountains in Tibet. This entry was posted on Wednesday, March 27th, 2013 at 06:00 and is filed under China, Chinese Culture, Chinese men, Chinese women, family values. You can follow any responses to this entry through the RSS 2.0 feed. You can leave a response, or trackback from your own site.